Styrofoam insulation in the headers provides a radiant barrier. 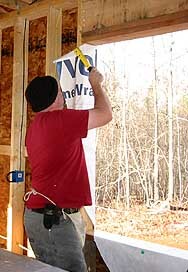 Tyvek is wrapped into the window opening and stapled back against the interior studs. Note the top piece of Tyvek is not stapled back but cut off level with the top frame of the window. 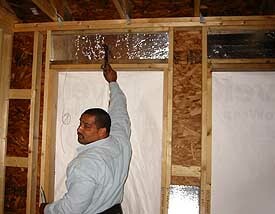 This is to prevent wicking of water into the home. 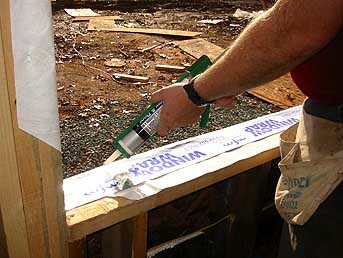 After Window Wrap is placed along the entire sill of the window, a bead of silicone caulk is used to help make a permanent gasket between the window and flashing material. Windows - Gorell Armor Glass Plus, Pennsylvania. Harrelson's Home Improvement Company is an authorized dealer for Gorell products. Window and Door Installation - Harrelson's Home Improvement Company.